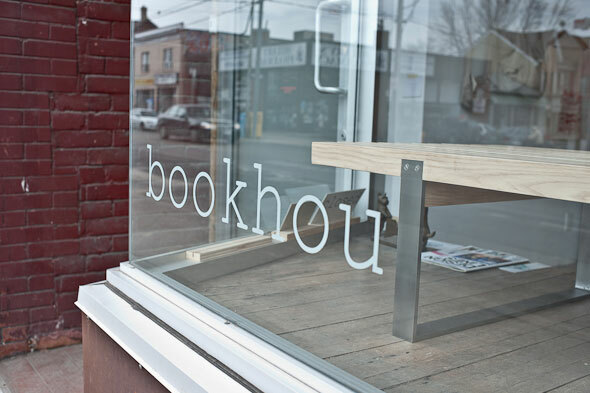 Bookhou is a gem of a store that I wish was in my neighbourhood - it strikes a perfect balance between local yet worldly, crafty and sophisticated, accessible and accomplished. Arounna Khounnoraj and John Booth have created an environment that I thought could only exist in the movies, or California, or maybe in Dwell . 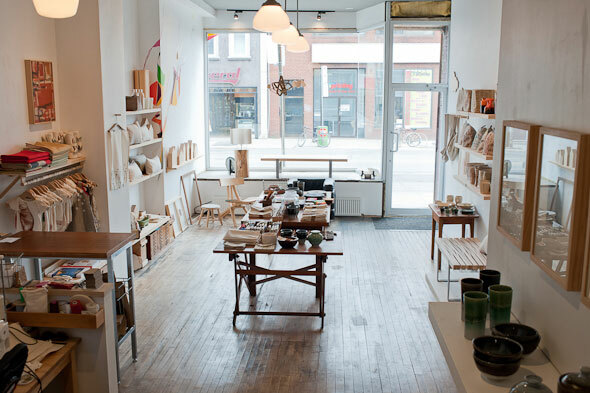 The shop is in fact the physical incarnation of a well-established web site that has been up and running for close to ten years. On a recent visit, the store is supposed to be closed, but it's a beautiful day so they've opened their doors. Arounna's young son is busy with his very important trucks in the middle of the store, and the baby strapped into a carrier on her back never makes a peep. I feel like I'm visiting an old friend in her living room. Indeed, it turns out I am; she lives in the building, and, I discover that we have so many mutual acquaintances, we might as well be old friends. 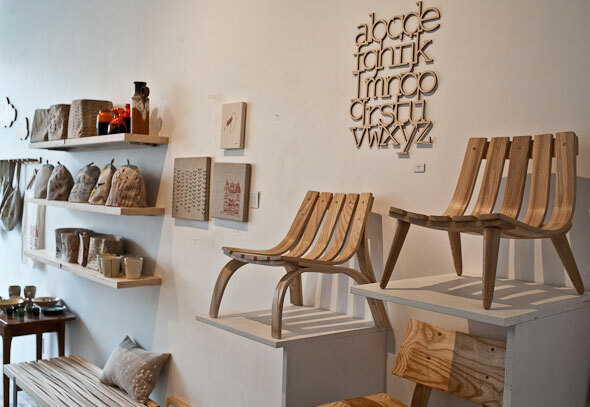 Arounna crafts everything from bags to cozies, all screen printed with simple and inviting designs. 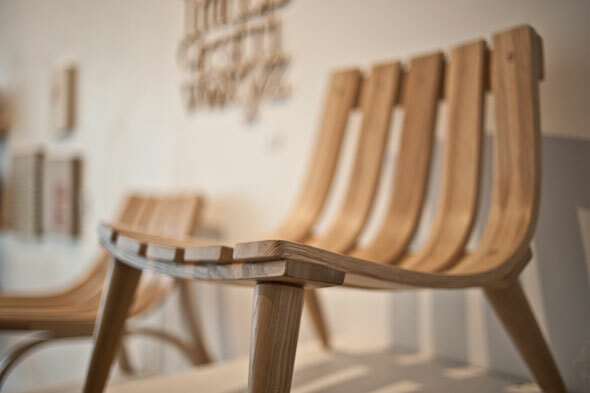 And John creates stunning benches and chairs using an innovative process that ignores traditional bent wood shapes. Flatpacked bentwood is both an impressive trick and an oxymoron. Bravo. A vintage printing press anchors the small shop, and allows them to offer courses in the now defunct craft of movable type. A generation or two ago, type for every newspaper was set - letter by painstaking letter - into a physical tray, which was then slathered with ink and pressed into paper. It was messy, hard, time-consuming work. 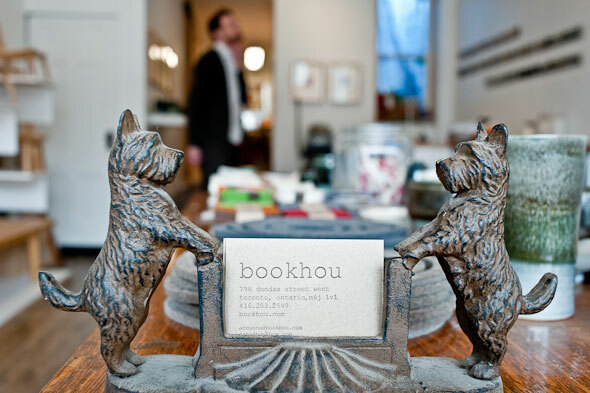 But Bookhou has re-branded it as rewarding fun. And it certainly is that. 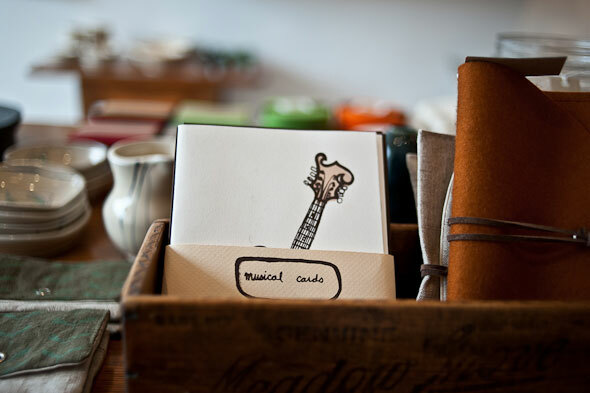 You can design and print things like event invitations yourself, and it's is an enjoyable way to pass an afternoon. Combined with courses in screen printing, you start imagining yourself as their next featured guest artist. 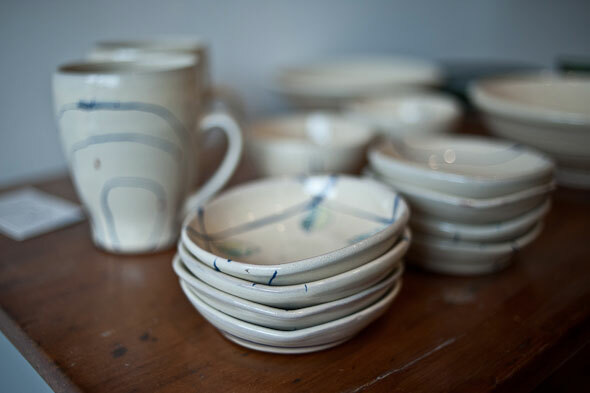 Currently that honour belongs to Shane McNutt's amazing pottery. When my friend Amy Fleischman told me she'd chosen this same backwater stretch of Dundas West to open up her restaurant, Musa , in 2000, I kinda bit my lip, "Really? Are you sure?" But she was adamant. And right. 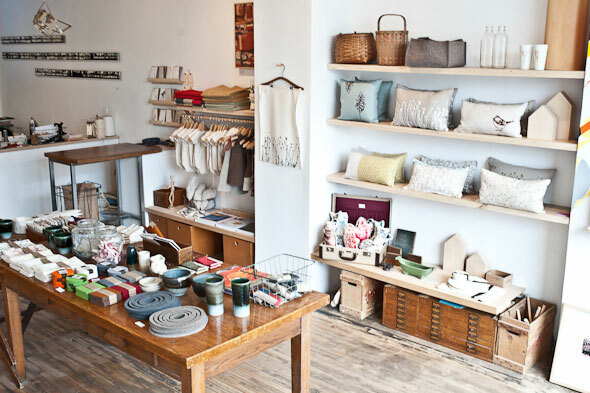 Since then, a long list of great shops and restaurants have moved into this happening neighbourhood - think Made , Ezra's Pound , Ella's Uncle , Saving Grace and the Hoof Cafe.